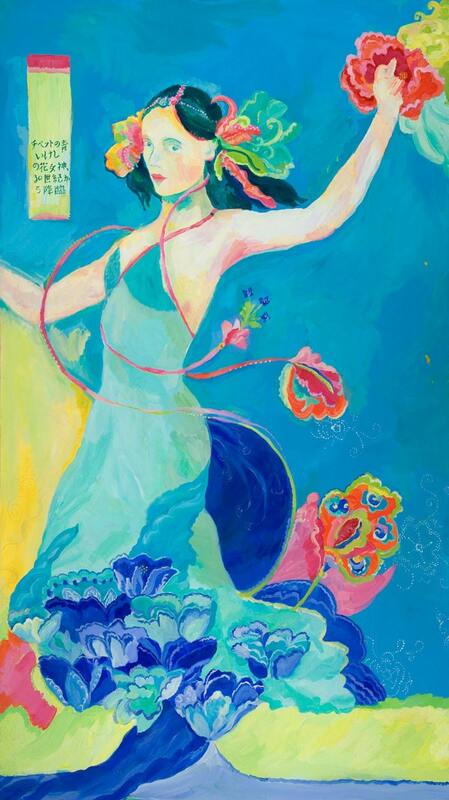 This is an archival giclee print of my original acrylic painting of Blue Tibetan Poppy Goddess. I had a vision that she came from the future; the banner in the upper left is painted in Japanese and translates as "the Blue Tibetan Poppy Goddess alights from the 30th century". Yes the beautiful sacred feminine is on her way in a big way! It is available in 5 sizes and printed on watercolor paper with a 1" border all around, and 8" x 14" stretched canvas. If you would like this print in other canvas sizes please convo me and I will set up a link for you. My giclees are printed on high quality acid free bright white watercolor paper using my Roland printer and Japanese archival inks made to last 200+ years. Awesome, high quality print. Looking forward to ordering more from Goldfish Marmalade. The colors are delicious! Thanks much! I love her so much!! Really beautiful. They were oohing and ahing at the frame shop. I will have to send you a photo when I pick it up in a few weeks! Thanks so much. Packaged really well too. Beautiful print! Lovely artist who is most attentive, with excellent communication and swift delivery! !